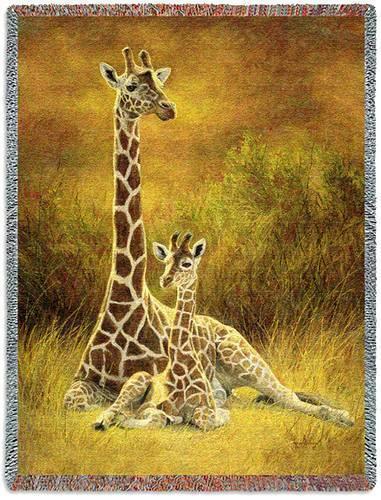 "Giraffe And Son Throw" This beautiful throw features a mother giraffe with her son resting quietly in a grassy field at sunset. This makes a great addition to a tropical decor or an excellent gift for the giraffe lover! Cotton blend. Woven on Jacquard looms. Measures 53" Wide x 70" Long. PLEASE NOTE: Shipping ONLY within the continental U.S. Hawaii, Alaska, and Puerto Rico residents please contact seller for shipping quote before ordering.